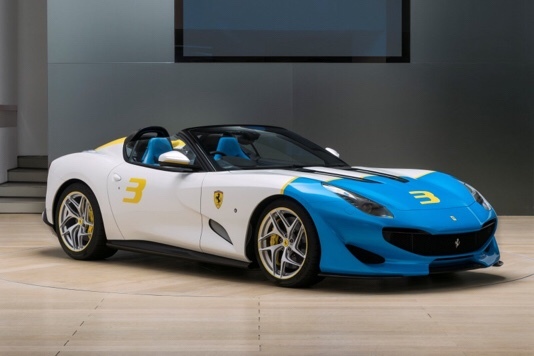 Ferrari has created this ravishing, open-roof machine using the running gear and chassis from an F12tdf as a starting point. 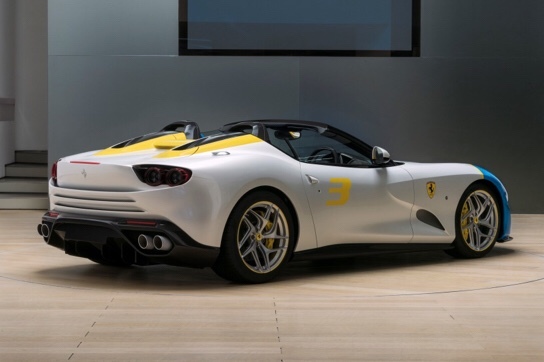 The SP3JC, a one-off project commissioned on this limited-series, is the maximum expression of open-air motoring, a throwback to Ferrari’s epic V12-engined spiders of the 50s and 60s. 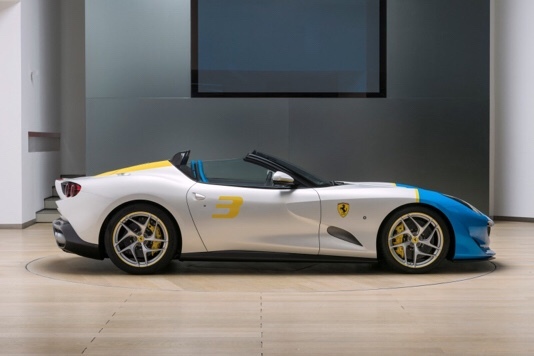 The SP3JC was commissioned by a Ferrari client and collector, and designed by the Ferrari Styling Centre. The SP3JC features a very muscular stance with dynamic sculpturing on the flanks, designed to emphasise the front-engine layout, a distinctive air intake outline at the front, and a dramatic rear fascia with horizontal slashes contributing to a wider stance. This is the Ferrari you will want, but can NEVER get. 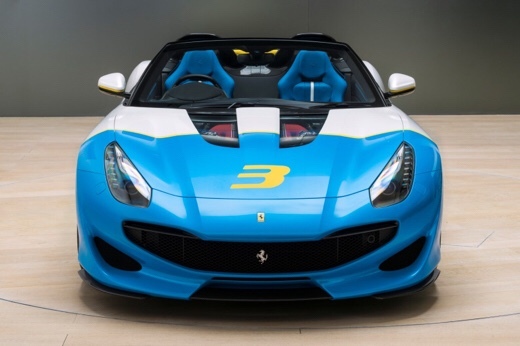 The client’s ‘passion for Pop Art’ is reflected in its colour scheme, and the unique combination of the Azzurro Met (blue) and Giallo Modena livery over the main Bianco Italia colour scheme underlines the car’s sensual volumes. The sporting theme is reinforced by specific detailing, such as split glass inserts on the bonnet to show off the 780cv V12 engine, a flying bridge between the fairings of the integral carbon-fibre roll hoops and a brushed aluminium external fuel filler cap. Owning a Ferrari is something that many aspire to, and few ever get to own. 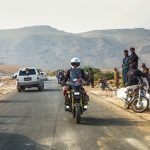 This client has the dosh to buy the car and do whatever he wants with it. Cooooool. Ferrari Pre-sells Entire Production Run of the Monzas, Despite the US$1.3 Million Price Tag!